The Barn, classic and Cornish, sits surrounded by fields and its garden and has been renovated in a simple contemporary style using oak and slate. A huge open plan living space beneath the original beams centres around the farmhouse table that separates a comfortable living space with an open log fire (free logs) from the Aga-warmed kitchen. The smooth slate heated flags are flooded with light from large French windows that all open on to the terrace and private garden. The open staircase leads to three bedrooms – oak floors, rafters, stone walls – lightly furnished in contemporary country style. One, the master bedroom with en-suite shower room, has a striking glass door leading to the old loading ramp while the "children's room" with bunk beds and singles is a great hang-out. Another double bedroom shares a bathroom with the children's room. This Barn has all the things you never knew you needed, from fantastic apple trees in the garden and hedgerows of blackberries. An outside warm shower! A fabulous Aga and fireplace. Your garden gate took you straight into the coastal path straight down to Trevone or up into Padstow. So peaceful with no people or cars around and so much wide life to watch and stargazing at night. Loved what the barn offered for our family stay. Children had plenty of room to play and explore. Location was fantastic! Kitchen was well equipped and accommodated 8 well. Beds we comfortable, linens nice. Wish towels were provided as were traveling from USA, but we managed. Aga stove was unique to us. We were in Cornwall when weather was sunny and warm, Aga made it a bit warm, though I can see it’s benefits year round for the typical chilly weather. Loved our stay! Great memories. Hosts were excellent! Everything from the first communication with the owners was beyond our expectations. The Barn itself was beautiful, stylish, clean with all facilities that a family of 5 might need. Suggestions for activities and restaurants were welcomed and used a lot! 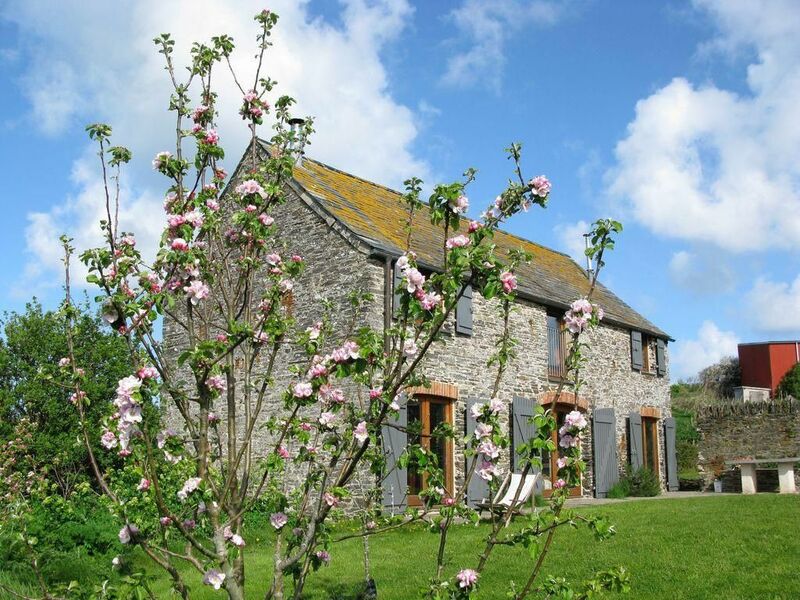 The Barn is situated just outside Trevone with a short walk across fields to get to the beach. There is so much to see and do with The Barn being the perfect place to relax, eat and play. We will definitely return and may do with friends so will take advantage of The Lynhay too. Wonderful barn conversion in stunning location! This was our second visit to the Lynhay; it's just such a special place! In fact, rather selfishly, I don't want too many people to know about it as it will become too popular :( Anyway... The barn conversion is so tastefully done with exposed slate, an Aga and lovely squashy settees...all the kitchen equipment you could ask for and so much style! Lovely bedrooms, linen, and all spotlessly clean. We just loved it and felt so at home. As if you need more there is a steel barn at the top of the property with activities and games for the children, so useful on wet days. The views and walks from the barns are truly wonderful; walk to Trevone beach in one direction, or over the fields into Padstow in the other. Headland walks, surfing, rock pooling all just there on the doorstep. Vivienne was lovely to deal with and nothing too much trouble! If you need space for a larger group there is a bigger barn on the same property - so could be perfect to be together- but apart. When you travel along the track from the Padstow Farm shop through fields you do not know quite what to expect but what a hidden gem. At last something beautiful to rent other than Cornish bungalows and you can walk to Trevone beach easily and into Padstow in 25 minutes (2 mins by car) .